For an added twist, we tried things, observed, learned, and made changes on the fly throughout the year – from content, to format, to development. Which, let’s be frank, may have made us look like we didn’t know what we were doing. This episode of Rainmaker.FM is brought to you by the Rainmaker Platform, which we will be talking about a little bit later — but you can see more of right now at RainmakerPlatform.com. Robert Bruce: Happy New Year Brian. Brian Clark: Happy New Year to you too. Robert Bruce: Thank you. It’s 2015, for those of you who are still in a fog rolling into the days of January here. Brian Clark: That would be me. So, thanks. Robert Bruce: Well you get a lot done, it seems. Some of which we are going to be talking about a little bit today but we have laid out a nice little plan for this episode. Another behind the scenes episode of Rainmaker.FM. The first half of the show we are going to take a look back at 2014 and the second half of the show we will be looking ahead at 2015. We were talking the other day that folks in and around the Copyblogger audience, if you are watching closely, you may have noticed some interesting things going on, you may have even questioned some of the decisions we have made over this last year, wondering why we are doing what we are doing. So we will talk about a few of those things and obviously, what we learned from them. Then will go onto 2015 in the second half of the show and what’s coming next for us, which hopefully will be informative and useful to all of you. Robert Bruce: Yeah Brian, what do you think about 2014, generally first? Some of these things, turns, decisions we made. Brian Clark: It was a big year. It seemed like a crazy year. We tried a lot of things, we learned a lot of things and we figured out a lot of things, and yet we did it all on purpose as a demonstration. When we launched this podcast at the beginning of 2014 we had a general plan for what we are trying to accomplish but we were really learning as we went, figuring things out, taking in feedback and seeing what worked and what didn’t. And of course, that early effort turned into the New Rainmaker training course, which shows that I’m still not a jaded old fart. But in our LinkedIn discussion group when they were talking about the best of 2014 from Copyblogger, several people chimed in and said it was the New Rainmaker training course that was their favorite thing from the year. That warmed my old jaded heart. Robert Bruce: Yeah, and let’s talk about that for a minute, because we started the podcast in January, we built on the Rainmaker Platform, both the product site and added the podcast to it, but it was always going to be more than a podcast. It was always like so much of what we do is going to be a demonstration of the platform itself, of marketing strategies and that initially turned into this Rainmaker training course, which was essentially seven episodes. The first seven episodes of this podcast that we repackaged, cleaned up, added transcripts and then three on top of that. Three separate webinars that you did. So there are ten lessons altogether in that course. Brian Clark: Well the interesting thing about that is that, yes, it culminated in a training course, but the podcast was actually the launch of the Rainmaker Platform pilot program, so that was a first for us. We launched not only a new line of business but the primary go-forward line of business for this company with a podcast. I think that really kind of spoke volumes, considering we are pretty much known as a writing focused company. Brian Clark: But it was outstanding. With the pilot program, we got a lot of enthusiastic people who understood the deal, “You are getting a great deal. You are going to help us make it better”, and literally from April to September we went to Version 2.0. It really was amazing. It’s amazing of course on the side of our developers, who I am extremely proud of, but I’m also proud of all the people who gave us crucial insight. Some of the stuff we kind of knew, and it was confirmed. Other people had requests, that we were like, “Yeah, that’s good.” And I really think that sort of customer-centric collaboration is what it’s all about. You know, building something according to what’s in your head and throwing it out there, it’s really not that all that smart a strategy, although you still see it all the time. Robert Bruce: Anything else you want to hit on the launch, Rainmaker 2.0 and the Rainmaker Platform? Brian Clark: Well, let’s just say that when you are betting the future on something and it goes well, you know adding another seven figure revenue line for the company, and pushing us into eight figures overall for the year, that’s pretty big. So I’ve got to say I’m pleased, despite the chaos. If it looked chaotic on the outside, multiply that by ten on the inside, and try and build a SaaS product, coordinate editorial and support and all that. But that’s the thing, 2014 really just set the stage for the go-forward, which you’ll start seeing being implemented this year. That’s all we’ll say about that right now because I think the demonstration of what this thing can do is the most important thing, instead of me just saying how wonderful it is. Robert Bruce: So back to this podcast in particular, we covered a lot of ground over the year and in a relatively few episodes. There was some specific things we wanted to cover which dictated our schedule for releases but one topic in particular kind of dominated the year, and that is curation. Brian Clark: Yes, so we took the summer off because we had work to do on evolving that 1.0 to a 2.0. By the way, that won’t happen again. Brian Clark: No. Hey if you want to take the summer off, that’s fine but I may quit everything else. I’m going to do the podcast of this show. I’m doing 50 at least this year. So yeah, we came back in the fall and we did a couple of interesting little NPR storytelling with guests. Brian Clark: With Tom Asacker, and Sally Hogshead, who will be keynoting at Authority Rainmaker. Some people liked them because they were short and quick, other people didn’t. But it took an incredible amount of work to do those little episodes. Right, Robert? Brian Clark: I had to write a script. I did the interview first, which is usually all a podcast is, as we demonstrated with the guests we had at the end of the year, then you take that, you select excerpts of what the guest expert said, and then you write a story around it. Then you give it to Robert to narrate. It was quite the production. I was proud of those two episodes but I don’t think we felt that the response was strong enough to justify that amount of work. Robert Bruce: Yeah it’s very interesting. The interview, the straight kind of interview shows, and the shows where you and I are rambling along talking, were some of the biggest ones and, of course, the content curation topic as well. Brian Clark: Yeah, so the curation one was more of an educational format. One thing we did catch is that some people like the interviews a lot and some people didn’t, because that is very standard in marketing podcast land. And I get that. We get that. That’s why we have experimented with different styles. We don’t want to be like everyone else. But one thing came through loud and clear is that people want to learn something. Whether it’s short, or it’s an hour long interview, there has to be a focus on education and I always try to do that, but I think it gave me some good insight into going forward. So anyway to your point, the curation topic was really kind of a tease at a new project, that at that time was nothing, because it was only an idea, and I hadn’t implemented anything at that point. But it was basically the roadmap of what I wanted to do with this new project that’s built on Rainmaker. Not only that, but completely done by me. I don’t have you, and I don’t have the Copyblogger team behind me really, I mean to the extent I need assistance with design work, Rafal of course is always there, but I kept the design really minimal. Anyway this is a busy CEO’s side project as case study of a curation business model. We didn’t know how that would resonate or not, but I thought it would do well because curation is a hot topic. You have got people talking about “content shock” and glut, and this and that, which I think is mostly overblown, but there is incredible value in being the person who finds the best stuff, packages it up, gives their perspective and commentary, and delivers it preferably by email. So that was my idea. So you and I did the show and it was like a home run. I mean people just went crazy over it. Robert Bruce: We are going to talk more in the second half of this show about your project in particular, without giving away any details. It was really kind of a basic overview. There was a little bit of shock in the sense of the history of Copyblogger and what we do, and what we are known for, versus a new kind of strategy. Not that Copyblogger, as you said in that episode, is going to move to a curation model. Brian Clark: No, Copyblogger is what it is. Brian Clark: This is an alternative approach to it, that I want to do no matter what. But I figured if people were interested it might make a good case study and it turns out people are interested. So taking that fact with the emphasis on education, you’ll see the next several episodes of this show focusing on that project, which we will talk about a little bit in the next part of this show. Robert Bruce: So we’ve chatted about this a couple of times, and we are trying to decide what to talk about and what not to talk about in terms of our next project here. I am going to leave it to you to start this little conversation. So away you go. Brian Clark: Yeah, and this is part of the “try it and figure it out” motif that was 2014. We started out with the brand, New Rainmaker, that was always supposed to signify content, and then of course we launched the Rainmaker Platform. And that of course is the SaaS service that allows you to do what we do effectively as we are demonstrating it. You have to be careful with a term like ‘rainmaker’. I mean people instantly get it in the context of sales and marketing but that also means that you have to be careful in a trademark sense. That it’s a generic term, so you have to have a trademarkable, ownable term to prevent confusion in the marketplace. That’s why it’s really important that we have modifiers like New Rainmaker, Rainmaker Platform and then people saw us introduce Rainmaker.FM. I understand why it happened but it was kind of concerning, you know, everyone was like “The New Rainmaker Platform, New Rainmaker”, you know, there was all this confusion in the insertion of ‘New’ because it’s in the domain name. Brian Clark: We do own RainmakerPlatform.com. It’s not the sexiest url but it’s easy for people to find the ever moving sales page for Rainmaker Platform. But that’s what I am talking about. If you’re looking from the outside, and you are like, “These guys are all over the place.” Hey, we did it in public, in front of you, on purpose, so you can see that we are not just making this up about iteration and adapting, and putting out there and figuring it out. That’s how it really works, and if some people want to say we were kind of inconsistent last year, that’s okay, but I think that’s the wrong lesson to take away from it. This is actually how it works if you are truly listening to the audience and to your customers. So in the fall, all of a sudden we introduced Rainmaker.FM, which is a url and we were using it for the name of this show. And right about that time is when we had the lightbulb moment, right Robert? Brian Clark: I think it was somewhere around when I started the interview series and, I’ll be honest with you, I did those interviews as a demonstration of what I consider a form a curation. You know, not putting myself out there as the expert in that context. I’m having a conversation with someone who I really want to hear from. I think it was David Siteman Garland that said, “The key to a great interview is being genuinely curious in what the other person has to say.” I think that’s why those interviews went so well. But the recurring theme that kept coming up about podcasting, and Jay Baer said some very interesting things about how we have video, and we have text and they are never going away, but audio is the only true mobile content format. So, here’s what I’ll say. This show will again be eventually known as New Rainmaker and Rainmaker.FM is something that encompasses that show. Now, can you guess what that is Robert? Robert Bruce: Yeah but I’m sitting here trying to remember what the heck we talked about in terms of what we are going to reveal and not reveal. I mean it will become clear soon enough. Brian Clark: Yeah. Let’s just put it this way. Right now Copyblogger is our flagship content site and we are about to launch another one. Brian Clark: It couldn’t be anymore different, but you have probably caught on if you have seen what we did in the last year. Again, launching a product with a podcast. So stay tuned on that. I think we will just wrap up 2014 on that note. Robert Bruce: Yeah, let’s leave it at that. 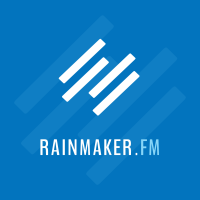 And let me say that this episode of Rainmaker.FM is brought to you by the RainmakerPlatform.com. If you are looking to easily build a powerful sales and marketing website that drives your online business, head over to RainmakerPlatform.com. There’s that url again, Brian. Head over there right now and sign up for a free 14 day trial to see if it might be a fit for you. Rainmaker handles all the technical elements of good online business practices for you. That’s design, content, traffic and conversion. And she does it all under one roof. Get over to RainmakerPlatform.com right now and get back to building your online business in 2015. Robert Bruce: Okay, speaking of 2015, you hinted at, and have been talking a bit about this new project of yours, and we had also touched on how the curation episode of this very podcast took off in the minds and imaginations of our listeners. What is that going to look like in regard to this project, this podcast and your project in 2015? Brian Clark: I believe the next three episodes of this show will be me doing a three-part case study on my curation project. I guess you could think of it as a mini course, like we did with the original New Rainmaker course from the beginning of 2014, but it will extend beyond that as I have new insights to give. So this will be kind of the core of “Here’s what I am doing. Here’s my strategy. Here’s my plan. Here’s how I plan to execute. I’m going to continue doing that and then the things that I do well and the things I screw up, I’ll come back and continue to report on. As we have been discussing, this is a curation project. Meaning I am finding and synthesizing content created by others to create these email newsletters that hopefully have high value and are able to build an audience because I am delivering value in the sense that I am finding the best stuff for people without them having to do it. One neat little package from someone that they trust. So I’ve actually, what am I on? I have done three issues, right? Robert Bruce: Yeah, I think that’s right. The third one was yesterday. Brian Clark: Yeah, I wrote the first two with no audience at all and then I kind of leaked it out on social media. So people are starting to figure out what it is but if you haven’t seen yet, it will be in the show notes but it’s called Further. Further.net. Not a cheap domain. Even for a .net. Robert Bruce: I was going to ask you about that. Let’s reveal the price tag on that. Brian Clark: You don’t want to know. Not as bad as you might be thinking but worse than maybe you are thinking. I don’t know. So, what is it about? It’s not about marketing necessarily. There are aspects of it that relate to entrepreneurship and marketing in that context but it’s really I guess, encapsulated in a pithy tagline, personal development without the fluff. It’s very science based research driven information, non-guru, non crazy, new age stuff about living your best life. In fact, that’s the headline on the homepage. “Live Your Best Life.” There’s a brief description and an email opt-in. So that’s it, Further.net. I guess the other two components you would want to know about from being able to follow along with the case study, would be the Facebook page, which goes by the handle facebook.com/furtherdotnet and on Twitter, it’s @furtherdotnet. Unfortunately, I wish Twitter would allow you to put dots in names. That would be much more attractive but they do not, so I had to spell it out. In both cases the dot is spelled out. Robert Bruce: So that is a look at what’s coming for content on this podcast. We are looking into the curation mini course, the case study of Brian’s new project, and there’s going to be interviews. There’s going to be a lot more than that. Robert Bruce: One thing that is directly related to that on the product side of what we are working on in 2015, is the suite of curation tools in the Rainmaker Platform. Brian, you and Rainmaker customers across the board do not have access to that yet but these tools are coming, and they are going to be in the standard package of the Rainmaker Platform. This is going to make your job a lot easier in a lot of ways. We have talked about this before what these tools are going to do and how they are going to help, particularly in the curation aspect of doing content, but what are your thoughts on some of this that is coming in relation to how you are doing things now? Brian Clark: Well without the tools inside Rainmaker, I am having to patch everything together which is the problem we are trying to solve, and in some cases I had to deal with some pretty annoying translation issues from page to newsletter template. Don’t even get me started. It was horrendous but hopefully that is all going to be worked out. The problem is, I wanted to get this thing started in advance so that we could kick off the year with this case study. So, you are right. Things will get easier when the curation tools are released as features inside of Rainmaker. Now here’s the good news, because if you have been following along with our product announcements for Rainmaker, we said the curation tools are part of the pro package, which will be fully delivered by the end of March. That includes marketing automation, adaptive content and the full learning management system and what else Robert? I mean there is a lot of cool stuff coming but that’s part of a more expensive plan. After I saw that reception of the curation episode and the fact that I’m doing this myself, I said, “Hey, let’s throw the curation tools in the standard package.” So if that’s not clear, if you buy Rainmaker right now, that’s the standard package. So when the curation tools are added, which is coming, you will automatically get that upgrade. You don’t even have to do anything because obviously we upgrade all Rainmaker sites for you. Another interesting thing that’s coming in the standard package, right now of course we are using Rainmaker to produce this very show. One show on one site. Well, Rainmaker is about to become capable of hosting many, many shows on one site, which will be very handy for this Rainmaker.FM thing. In fact have I said too much? Robert Bruce: I almost just stopped you, but I think we are still okay. I mean I don’t want to make a damn circus out of this. Brian Clark: You love a good circus. Robert Bruce: But yeah, you are right, it’s going to make things a lot easier for the project we are doing called Rainmaker.FM. The next iteration. The next evolution of Rainmaker.FM. All of these details will be coming out. We don’t mean to be coy here but yeah, and that will be part of the standard, to Brian’s point, of the standard Rainmaker platform. Brian Clark: If you have been waiting to get onboard because you felt like you had to invest in the professional package to get these particular capabilities, including podcast stats, multiple podcasts hosting on one site and all the curation tools. You don’t have to sweat it because you could get started right now and those features will be out shortly. I’d say within the month. A month and a half at the latest. That’s my latest word from development. So it’s very exciting. My curation product is a demonstration that I am going to do a case study of. Rainmaker.FM is going to become a highly educational content site that is also a demonstration of the Rainmaker Platform. I think you kind of get the feel here. We are committed to teaching you one way or another whether you use our products or not, but it’s going to be pretty apparent how much easier and more powerful the Rainmaker Platform allows you to be to do these kind of projects. Robert Bruce: Let’s close this episode out about content and let’s go back to content strategy and philosophy. You brought something to the table a few months ago, this idea of adaptive content. How do you want to approach this? Is it something we are going to be focusing on a lot in 2015? How do you want to introduce this to the Rainmaker audience? Brian Clark: Well I think adaptive content is, or can be, a confusing topic if you have heard of it at all, but you will. In the sense that there are many definitions of it. I mean I have seen people talk about adaptive content starting with mobile responsive design, which of course we have been doing at StudioPress and with Rainmaker as a matter of course. It’s a mobile world now. If your site doesn’t render automatically on a phone, a tablet, a laptop or a desktop, you’ve got issues. To me that’s just web 101 now. And of course, that is built right into Rainmaker. It’s adaptive in the sense that it senses what device or what screen size you are on, and it adjusts. But the broader concept of adaptive content is the type of user you are based on your interests and needs, the content itself changes. So that sounds a little bit like marketing automation and I think we have been using the two terms side by side because I think there is a line. But there is a reason why most of the marketing automation companies, Marketo, Eloqua, and even HubSpot are very expensive and they are aimed at companies that have sales teams. Marketing automation is really identifying moments when you can identify that a person is ripe to speak to a member of the sales team. Adaptive content is more for companies like Copyblogger Media, where we sell online or for service companies for example that do lead generation online but it’s not exactly going to a 20 person sales team. It might be coming into a realtor. Like when I was a broker, the leads came in by email and then I distributed them as necessary to agents and all that kind of stuff. It’s really the content and your copy that is your sales team, whether you are selling digitally online or you are doing lead generation of the type that I just mentioned. So adaptive content is really about being your sales team, being the right sales person at the right time, for the right person. I think that’s the best way to think about it. But I guess, you are going to be learning more about it. I’m working with Jerod and Demian on the series Demian is producing because as we were building out the advance features of Rainmaker, we realized it’s really an adaptive content platform. And rather than a buzz phrase, I think adaptive content is just what content marketing will be in the future as consumers whether, B2B or B2C, or whatever the case maybe, will expect a more responsive and personalized experience. It’s no longer good enough just to produce content that half or 60% of people on any given day are not interested in. I am not denigrating that because that’s how Copyblogger was built. But the technology is getting smarter and that means that your competitors are going to start doing it. It’s really not super complicated, it’s actually kind of wonderful. Remember, Robert, the theme of the New Rainmaker training course and again, if you haven’t taken that, go sign up. I think 30,000 people have taken it, which is pretty cool. But create less content with more impact. Well that’s what adaptive content allows you to do. You are able to serve up the right article from your archives at the right time, instead of it being buried back there. There is stuff in the Copyblogger archives that I’ll stumble upon and I’m like, “Ah, I wrote that?” That’s not how it should be and that’s not how it’s going to be. It’s the technology that’s exemplified by what Rainmaker is evolving into with the professional edition that will be out by March. So that’s why we are starting this educational campaign primarily on Copyblogger, and also on this show, about adaptive content and how you do it. Robert Bruce: So that’s a very brief look at 2015. What’s coming for us and as it relates to you. I mean we didn’t even touch on things like Authority Rainmaker, the live show we are putting on in Denver in May. We didn’t touch on a major shift that we are doing regarding email on Copyblogger, but we will be talking about that. Brian Clark: Well you know we killed blog comments and our Facebook page last year, so we had to top that somehow. I would expect we might have some surprises. Robert Bruce: I think so. Well thank you for listening everybody. 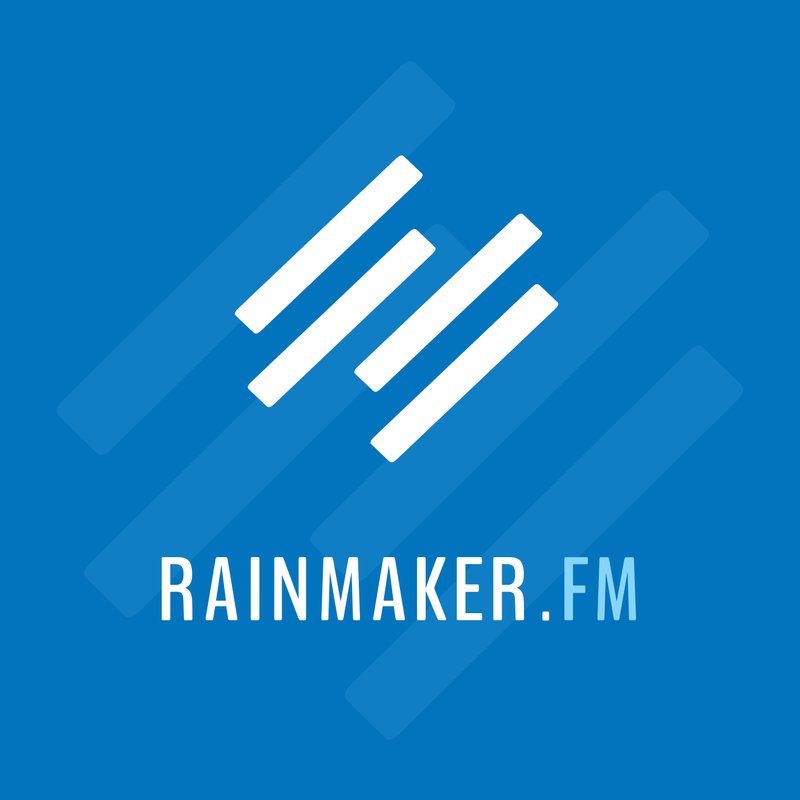 If you would like to get Rainmaker.FM delivered to your digital doorstep and not miss a thing in 2015, head over to rainmaker.fm and sign up by email. Just click that big green button you’ll find at the top of the page there and we’ll take care of the rest. And if you want to go direct to iTunes and subscribe to Rainmaker.FM in iTunes, I’ve got a little bitly link for you. It’s bit.ly/rainmaker.fm and it will take you directly to the iTunes page. Brian Clark: And if you would like to give us a nice review or some stars of some sort, that would be wonderful. Robert Bruce: Some stars of some sort. Yes, that is the language that iTunes understands. So yes, a rating or a comment over in iTunes is extremely helpful if you like this show and you want to see us do better in iTunes. Thank you for that. We always appreciate it. Wherever or whenever you are out there on the Internet, good luck to you. Brian, thanks for this episode. See you next week.